The North Carolina Courage is in the midst of what's looking like one of the most successful seasons ever for an American women's pro team. 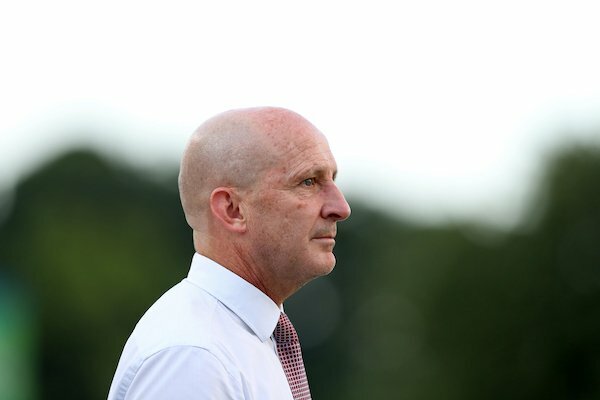 Coach Paul Riley, the 2017 NWSL Coach of the Year after the Courage won the regular-season title and finished runner-up, guided the Courage to this year's regular-season title with four games to spare, and to the International Champions Cup title. Riley, who coached the Western New York Flash to the 2016 NWSL title before the Flash moved to North Carolina and became the Courage, continues to serve as Director of Coaching for New York youth clubs Albertson Fury and FC Fury NY, both of which compete in the U.S. Soccer Girls Development Academy. The Albertson Fury had played in the ECNL since its 2009 founding through last season. PAUL RILEY: I know the people involved at the youth national team level. Listen, they’re trying to pick the best players in the country. Of that, there’s no question. I don’t think they’re bad coaches, either. I don’t think there are any bad coaches in there. And I don’t think they’re picking X because Y. I think they’re just picking players. It’s a massive country and our scouting needs to get better. That’s probably the most important thing. I think the coaches are picking the best they can. But we need better scouting throughout everything. PAUL RILEY: The organizations … They talk about politics. I’ve been involved in the ECNL for a long time and that’s politically run, too. They’re all the same. You can’t say one is more political than the other. Everyone makes decisions based on what’s good for their club and what’s good for them, and maybe not what’s good for the game. The ECNL has a playoff system where you have playoffs, then you have playoffs. Why do you have playoffs, then playoffs? It’s more money the parents have to spend. And I don’t like the ECNL model of three practices to two games. I think it’s wrong. I think the DA has it right, with four practices to one game. I think you’re getting too many injuries at the youth level with a three-to-two practice-game ratio. That’s something I would change immediately. The question is now, can we all get on the same page and all work together? SA: You believe in an American youth soccer landscape in which the ECNL and U.S. Soccer work together? PAUL RILEY: I think we have to work together. I think there’s room for everybody at the table. I think we all need to be at the table to make it work. I just want the youth to improve. I hope the ECNL and the DA will come together and try. The DA, four-to-one practice-game ratio, no high school ball, is probably the right way to go. Now the question is can you get all the best clubs there. The ECNL has a lot of good clubs but has three-to-two ratio and playoffs after playoffs after playoffs, a lot of money spent traveling all over the country. We have to limit that, too -- the pay-to-play part of it. I don’t think it’s a massive issue, but I do think it can be changed and improved. SA: Anything else you’d like to see at the youth level? PAUL RILEY: We need to get into Hispanic communities, which we haven’t done on the girls side. We need to get into any neighborhoods where we think we can find players, and give them opportunities. We’ve done it on the boys side, I think the DA has helped on the boys. But on the girls side we haven’t gone there yet. I think we have to do that. SA: Last month the USA failed to get out of the group stage at the 2018 U-20 Women’s World Cup. Same as the U-17s at the 2016 U-17 World Cup. Thoughts on that? PAUL RILEY: I’m a little bit disappointed. We have a lot of individuality, it seems, on a lot of our teams. The youth national teams rely on certain individuals and I think it’s probably the same on the full national team, too. I think it needs to be a more team-based, a more tactical-based type of approach to the game. I don’t think you can shoo-in every age group into the same formation and play it. You need specifics for what makes your team and your players better. We don’t seem to provide No. 10s with a place to play, and I think we need to do that. SA: More emphasis on the playmaker position, the No. 10? PAUL RILEY: I’m a bit biased, because we [North Carolina Courage] play with two 10s, so for me it’s different, but I feel we can do that at the national team level. The U-20s were very individualized and when the full team plays it’s very individualized. If you stop [Megan] Rapinoe and if you stop Mallory Pugh in those wide areas … if you play a back five against the U.S. national team, [the U.S.] will have trouble breaking the team down. You need 10s, you need to have your Horans [Lindsey Horan] and the Tobins [Tobin Heath] in central, where they can break you down on the dribble, break you down on the pass. Creating those type of players, growing those type of players in the younger programs is hugely important. SA: What can be done at the youth level to encourage No. 10s? PAUL RILEY: I think we still keep going back to the athleticism … The first thing everybody says is, she’s not quick enough. She’s not athletic enough. But look at my No. 10, Debinha. She’s not super quick, but great on the ball, great vision, great at finding space, great final ball, runs in deep and scores goals, gets assists. Look at Denise O'Sullivan, not a great finisher, but great provider, great passer of the ball, great vision. Sees the game immensely well and quickly. Finds space all the time. The instinct from watching games all the time. They’re two foreign players, but I’ll play Crystal Dunn in the 10 and Crystal is a different type of 10. A 10 doesn’t have to be a Lionel Messi. It can be a different type of 10 and Crystal offers a different type of 10. She’s good at finding space. She’s good on the dribble. She’s not a great passer of the ball. So, you look at those qualities in a 10. Can we get those qualities? Rose Lavelle for me could be a great 10. She’s got the qualities on the dribble, she can break you down, she’s got a great final ball, she can score, she assists. There are all types of variances in a 10. I think a different formation will help 10s to develop. I feel we’re wedded to the 4-3-3 and that’s the end of it. And even the 10 in a 4-3-3 is more of a No. 8. SA: Making more use of central playmaker will also improve the frontline effectiveness? Alex Morgan scores for fun with the national team but when she comes up against better defenses in the NWSL, maybe not so much. She doesn’t get as many chances. She’s a pretty direct player and has problems creating goals and scoring goals in the NWSL over the last few years. You don’t get the balls. It's maybe because of not playing with No. 10s. I think the development of the No. 10 is a huge factor in the next cycle – for the Lavelles and Horans to become major pieces for us – and develop the younger 10s in the younger age groups, whether it be U-15s or U-17s, U-20s. The tactical game is changing. It’s getting better and I think we’re still stuck in this athletic 4-3-3, individuality, bomb it forward type of mentality. I think we have to change if we’re going to stay at the top. Because we have so much talent on the national team, as you can see. When you look at the players week in and week out in the NWSL, they’re just fabulous players. Hopefully, the younger groups coming forward can be even better. That’s what I want. I don’t want to be the same, I want the younger players to be better. We need to get really creative players, who see the game well. PAUL RILEY: Yes, get it to the wingers and take the player on -- it’s gotta be more sophisticated than that. With the national team, there’s the problem. Playing against a back four, and the winger is really good, Mallory Pugh against a player, she beats the player 19 out of 20 times against a Mexico or Russia. But then you come up against a Sweden with a back five and you’ve got a fullback and a center back to get through. All of a sudden that player can’t do that anymore and it makes life a lot harder. Then what? What’s Plan B? I would play a back five against the U.S. and I think they’d really struggle to break a back five. Don’t be thinking the European teams aren’t looking at that and thinking the same thing, because they probably are. You force them to come central, and central I don’t know if that’s Plan B.
I watch the youth teams and they just don’t play through the middle enough. They go wide quickly and rely on the wide areas and use our athleticism. SA: What’s your approach with the North Carolina Courage? PAUL RILEY: I always tell our players, we play through the gut. We’re very narrow, with two 6s, two 10s, and two 9s – and it’s all about creating angles and half spaces and central spaces and who goes wide and who stays in. SA: What else is important for players to become exceptional No. 10s? PAUL RILEY: To use Vero as an example: She was a Spanish international and what a player she was. What vision. You could speak to her for hours about the sport. She watched every game. She learned from watching, and that’s a huge part of it. We do a lot of vertical and horizontal switches in the game where the 10 and 6 flip and the two 6s flip and the 10s flip. There’s a lot rotation in that, and that vertical rotation is something that I don’t know if a lot of youth players will understand. If you watch the games, you can see it. With little things like that we can get our 10s better, our 6s better. I look at the midfield a lot because I think that’s the key to our future, to improve the midfield. Make them so they can break teams down, no matter who it is, no matter how many players they defend with. SA: Your North Carolina Courage clinched the NWSL regular season title with four games to spare. What’s been the key to success? PAUL RILEY: The team is just maturing, really. It’s been the same team for almost three years. We’ve added a few important pieces: O'Sullivan, Debinha, Crystal Dunn, Merritt Mathias. Most of the rest of the players have been with us for three years. Just matured, growing up and becoming a good team. Away from home we’re unbeaten. Eight wins and four ties, which in this league is almost a minor miracle, with the different fields you play on, different conditions, size of field, hotels, cities, travel. Home form’s been good. It’s a little bit harder at home. Teams player deeper against us, making it harder. Now we’ve gotten used to playing against teams that sit deep. We used to be a very transition-based team, but now we’ve turned into more of a possession and transition team, which makes it difficult for the opponent. That’s been a big plus for us. We’ve been able to hit teams on the counter, and then we’re able to get possession in their half of the field and break them down, switch them around. The big thing is the formation. We’ve stuck with the same formation. We’ve tweaked it a little bit depending on who’s in midfield. We’ve got four, really five great midfielders. So far so good, but not much of it will count if the job doesn’t get done in the end. PAUL RILEY: It was great for the league, never mind the team or the club. When you have Carli Lloyd and Alex Morgan and Emily Sonnett and Lindsay Horan wanting us to win, then I think it says a lot. They want this league to be the best in the world and I think that was part of it. They wanted us to beat Lyon. Everybody talks about Lyon being the best club in the world. Lyon was very good, in all fairness, they’re a good team. It was good for us to see a different tactical look. We’re used to pressing teams hard here and them giving it away. Against Lyon, we pressed hard and we just couldn’t pick the ball up. They’re too technical in tight areas. They made us play in a different way. In the final, we played differently than we normally do. We dropped back a little bit more and got compact, which isn’t like us. Normally, it’s a free-for-all for us, press high, force teams into zones we want them in, and we usually get the ball. Against Lyon, we couldn’t get the ball, no matter what we did. So we dropped back and let them have the ball and do their thing. And hit them on transition. The good thing is having a team that can play both ways and we do have that. 11 comments about "Paul Riley on ECNL vs. DA, the need for No. 10s, and the North Carolina Courage's stellar season". Bob Ashpole, September 7, 2018 at 9:50 a.m.
"The good thing is having a team that can play both ways and we do have that." This deserves repeating. It doesn't just apply to the defending moment (high press vs. lower line of confrontation), but to every moment of soccer. Earlier Riley was talking about playing narrow instead of a wide wing-play dependent attack. Teams need to be able to attack on both flanks and in the center, dominating the opponent. In earlier days when players were responsible for on field tactics and before plentiful substitutions, player flexibility and adaption was bread and butter of the game. Developing players used to get these abilities from playing unorganized soccer. Today coaches are taking away too many decisions from the players during development. I would stress fundamentals during development and let the players apply the fundamentals to solve tactical problems. Instead we get an emphasis on "game plans" to such an extent that some coaches teach team tactics disguised as fundamentals, i.e., tactics become habits rather than choices. s fatschel, September 7, 2018 at 10:16 a.m. The ECNL could make some simple changes. First dispose of it's archaic tournament based program. No need to take college funds and give to hotels and restaurants. Second implement minimum starts. That way if you have a heavy game based schedule at least players are being rotated. Ben Myers, September 7, 2018 at 11:16 a.m.
"The need for number 10's"! It's not just the women's game that needs number 10's. Look at the USMNT, current and past, back to the 2014 World Cup? Where is the number 10 to orchestrate? This is yet another area where player development in the US seems to fall short. Bob Ashpole replied, September 7, 2018 at 6:16 p.m.
Ben, I see the problem, especially with the WNT, as a coaching problem not a player problem. We have players with the skills, but the coaches take the team in a different direction--breaking down defenses with 1v1 wing play. When the WNT stops winning competitions, that is when I expect change to occur. It is just not human nature to change after experiencing success. Despite all the hype, I don't have a high opinion of the younger half of the MNT player pool. Even Pulisic is at least 6 years away from physical maturity and completion of development. Younger players should be given the opportunity to develop without a lot of hype. So I see the problem with the MNT as both a coaching problem and also a lack of the skilled player pool at the depth that the women have. On the coaching side, it won't do any good to develop a technicallly skilled pool if USSF doesn't want to change its so-called "aggressive" style of play. R2 Dad, September 7, 2018 at 11:22 a.m. This coach is right about 10s--our country doesn't produce them because so few teams have enough possession to use them, including the Nats teams. I've seen them--they're out there. My two examples of skillful players on the girls side: Santa Clara Sporting had this small-ish Indian girl, a 95 I think--smart, vision, great passer, not an athlete but brilliant to watch her run the team. I doubt she found the right program and right coach to use those skills since they're so few and far in between. And Castro Valley, also a 95, super quick, should have been a 10 but used as a destroyer instead--convenient for the coach but did nothing for the girl's development. I don't ref girls matches much anymore--too depressing with all the professional fouls and lack of skill. Bob Ashpole replied, September 7, 2018 at 6:29 p.m. I agree R2 Dad. Although I don't favor systems that push the whole attack through 1 player. In the ideal 433, all three CMs are skillful enough so that playmaking and the other roles can be shared making the attack more unpredictable and difficult to defend against. Riley said he likes to use two 10s. I used to say (when Barca was in its glory years) Barca plays like they have 4 No. 10s. R2 Dad replied, September 11, 2018 at 11:45 p.m. I'd settle for even one! Ric Fonseca, September 7, 2018 at 4:14 p.m. Very interesting indeed. The main focus is the development of 10's in order for the US to have positive and well-rounded forwards and what ails the overall developmental processes on the women's side of the national team equations. However, and here I go, some of you will say, here he is again, to devote a mere three lines fo the lack of attention being "not-showered" on the "Hispanic" I feel will come back and bite them on the rear end. Why, consider that while Liga MX and its clubs have been scouting the country for potential and eligible youth male players, and signing and or even for the Mexican NT, is now being very broadly alked about for potential skilled women players of Mexican ancestry. I was recently in Mexico City and had this discussion with a relative who works in football game broadcasting, and we concluded that until Mexico develops at an even more expansive and greater scouting program (cf: C. Cuellar SA interview) more and more Latina young women will be heading to Mexico as the Mexican Federation has seen the benefit of sending scouts to ID talent for the men's side, it is now focusing on the women's side. Lastly, I've said before that I have seen more and more Mexican-American young women, high schoolers pick up the game at even greater numbers, which to me is indicative that a different generation is now making sure that the senoritas get a chance to play the sport. Now, the question begs, and that is if US Soccer and the alphabet collection of leagues/groups,associations will expand their scouting processes or will continue to provide nothing but some empty words. Just saying! Wooden Ships replied, September 7, 2018 at 5:33 p.m. I agree with you Ric. Until our national teams and academies begin to staff with Latin-American anscestrial coaches, we will continue to exclude and not evolve our game. G C, September 23, 2018 at 1:34 p.m. This is one of the best and most informative interveiws that I've seen on this site. Paul Riley is not only insightful, he is honest. He is honest about ECNL, which will eventually have to realize that it must take a backseat to the DA. He is honest of national team and even names players and their limitations. He is honest about our development pipeline. He is also insightful. He provides specifics, examples and he explains why certain approaches work and why they do not. He is a gem.